Offering priceless wisdom, this rare guide to weight loss opens up new opportunities for spiritual growth. Hatha yoga, the physical practice of yoga postures, is finally losing its (sadly) accurate reputation in the Western world as the domain of the thin, fit, flexible, and affluent white female. The groundswell of diversity in the yoga studio is reaching a critical mass and is opening up whole new worlds of health and healing to those who, one can argue, need it the most. 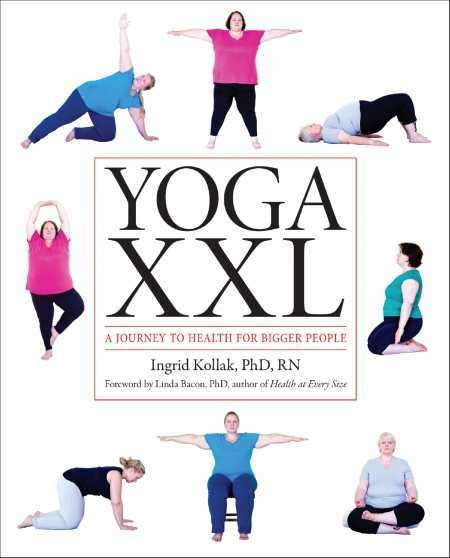 Ingrid Kollak, a registered nurse, yoga teacher, and author of two previous books on yoga, got right down to business in Yoga XXL. The refreshing dearth of several opening chapters heavy on statistics, meaningful anecdotes, and self-help verbiage is a rare and special treat in the yoga-book world. In chapter two, “Getting Started,” Kollak covers, in ten pages, all the necessary prerequisites, such as questions to ask a potential yoga teacher, what to wear, and the value of keeping a journal. She concludes the chapter with a priceless reminder: set aside expectations and experience the joy. The next two-hundred-plus pages are devoted to expert instruction of several dozen postures. Kollak does a superb job of choosing accessible postures and illustrating each with a photo or three of a larger woman model. The descriptions, contraindications, alignments, and instructions for each posture are overly thorough—a good thing. Developing a fulfilling and effective yoga practice is different for larger bodies. A simple forward fold is not so simple. Standing on one leg can compound hip and knee pain. Child’s pose feels awkward and uncomfortable. So much of what goes on with the body in yoga is subtle, from engaging the pelvic floor to opening the heart and breathing fully. A great teacher is one who constantly reminds her students to pull up, lengthen, open, release, and be present in their body. Kollak gets this. Professionally packaged, high quality books, like Yoga XXL, that take the differently-abled needs of larger yoginis seriously, are necessary. And with the epidemic of the overweight in the Occidental world, the market for books of this ilk that share the priceless wisdom of the Orient is both thriving and transforming.